Having many SEO clients, I have to adapt quickly to changes in the Google algorithm. I was hustling to do what a rumor had led many of us to believe. The rumor was that you must have one site, which was of a responsive design (meaning it would adapt to different screen sizes) or Google would penalize you. Since that rumor started, Google announced the launch date of the new algorithm, April 21st, 2015. Rumor truths are that you must have a mobile friendly website. Rumor falsies are that you must have one site that is mobile responsive. If you have a separate “moble.YourWebsite.com” site, you are in great shape. The purpose of the new algorithm is to only show mobile friendly website in searches from mobile devices. If you are thinking that all of your visitors are going to your site via a large screen, you are likely wrong. At a minimum 1 in 5 of your clicks comes from a mobile device. Most businesses are getting 2 of 5 clicks from searches from a mobile device. 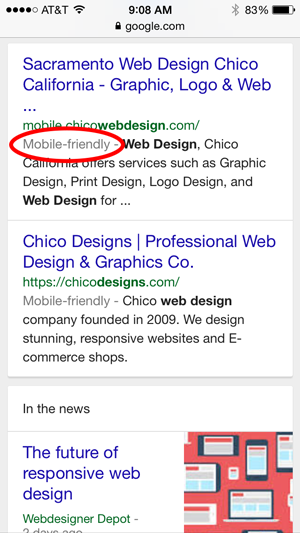 If your site is not mobile friendly, you will no longer be getting these clicks because your site will no longer be showing in mobile searches. If you want to know if your site is mobile friendly you can find out now, before the April 21st roll out. Just find your site in a Google search result and look for the grey text.